Listening The Jam's In The City this evening, I noticed for thefirst time -- I know, this may seem odd -- how much it sounds like the pre-psychedelic incarnation of The Who. I'm sure that was deliberate, given The Jam's many nods to Mod. But my interest in classifying The Jam in relation to both first-generation punk and The Cure, a band that was originally considered to be a Jam copycat, somehow deafened me to the strains of the mid-1960s that impressed themselves with such force upon me on this listen. Because I love the early Kinks, Who and Revolver-era Beatles more than almost anything shy of cherry pie, making the connection allowed me to inhabit The Jam's music in a new way. I was transfixed. I'm glad this happened if only for the reason of deepening your pleasure and it would seem odd only if your genealogical axis was not tilted laterally rather than anteriorly. I know next-to-nothing about the early Cure so that was news to me - a subject for further research for sure. 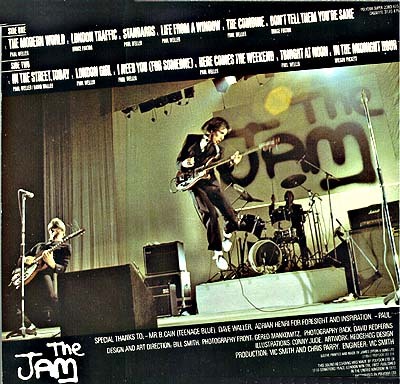 When I think of the early Jam, I remember just how thrilled I was by the second album's back cover photo of Bruce Foxton in flight. I like your formulation: "tilted laterally rather than anteriorly." I guess I've been thinking more anteriorly about punk recently, particularly in relation to mid-1960s rock, because of writing that piece on garage rock for The Oxford American, for which I listened to both various Nuggets collections and a variety of regional compilations -- most on Tucson's own Cicadelic Records -- that mostly featured tracks from 1965-1967. Still, whatever my prior research focus, it seems ridiculous to have overlooked the nostalgia for a temporally recent but culturally and politically remote past in In the City, not only because of the way it sounds overall, but because it includes a cover of the Batman theme song. You can't more obvious than that in terms of referencing the mid-1960s. That back cover photo is great! I found myself jumping around to the album the night before lost, so Foxton's hangtime makes sense to me. The person who signed The Cure explicitly told Robert Smith that he wanted a band just like The Jam. Smith didn't like the notion, which is why he fired the bassist from Three Imaginary Boys before cutting the band's second album, purportedly with the explanation that said bassist -- Michael Dempsey, I believe -- had "played too many notes."